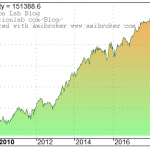 We present in this article a novel strategy based on features generated by DLPAL LS software in the weekly time frame that trades long/short 85 large cap stocks from the S&P 100 universe and combines buy and hold, trend-following, position and short term trading. The usual paradigm in trading strategy development involves differentiating buying and holding securities from timing strategies, such as trend-following, position and short-term trading. The strategy in this article presents a novel paradigm where all these different styles of trading arise from the same algorithm and are naturally combined to generate the end result. The main advantage of buy and hold strategies is minimization of transaction cost. 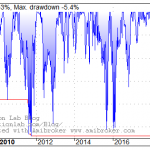 The main disadvantage is that they cannot deal with a large drawdown and as a result risk-adjusted returns are usually lower than those of effective timing strategies. Trend-following attempts to maximize returns by squeezing as much profit as possible from price trends. The main disadvantage of these strategies is lower performance during sideways markets that can even erase gains from long uptrends. Timing price action is difficult due to noise but if done properly it can offer a high win rate and profit factor at low exposure to price action. The main disadvantage is increased transaction cost that in some cases is a large portion of realized profit. Combining buy and hold, trend-following and position/short-term trading can be done with naive approaches that integrate related strategies but in the case of the strategy presented in the article, this combination arises naturally from the application of the same algo. The key is in generating features that facilitate the combination. This is done by DLPAL LS software, which offers unique ways of dealing with price action. 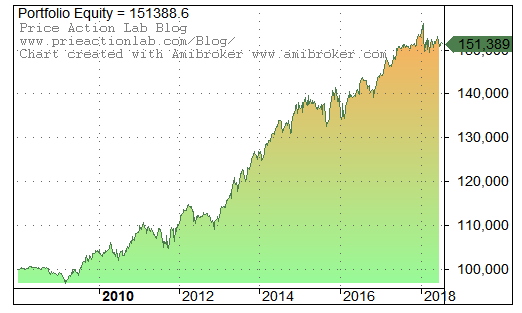 For strategy development we used weekly adjusted data of 85 stocks from the S&P 100 universe that have price history going back to year 2000. 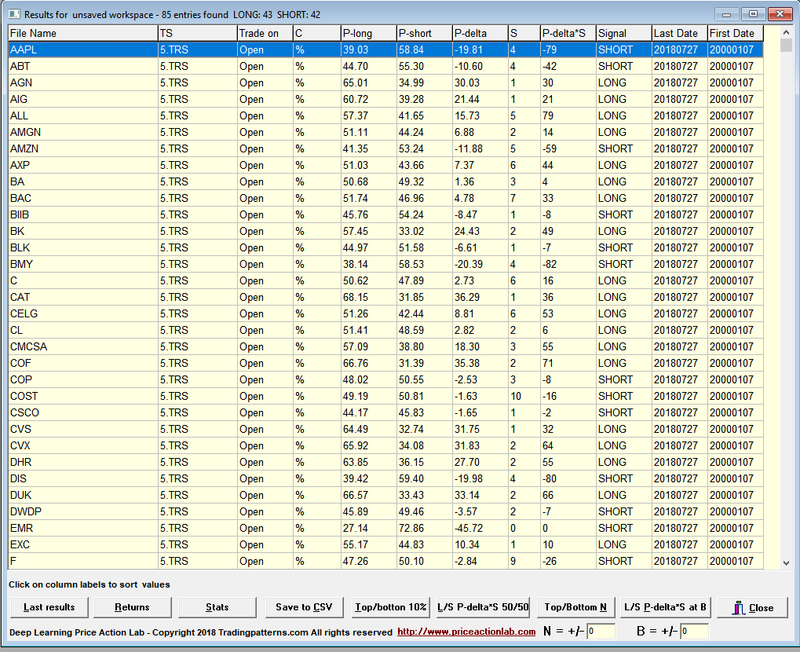 In the above setup we select the directory with the weekly data for the 85 stocks. 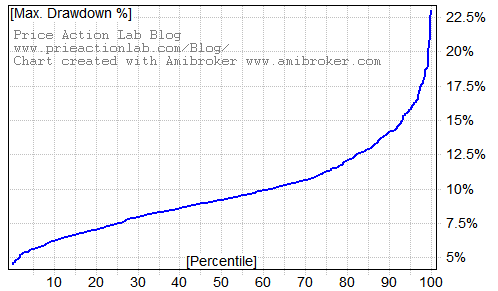 We also select a T/S file with 5% profit target and 5% stop-loss for feature classification. This is a reasonable size reward/risk for weekly data. 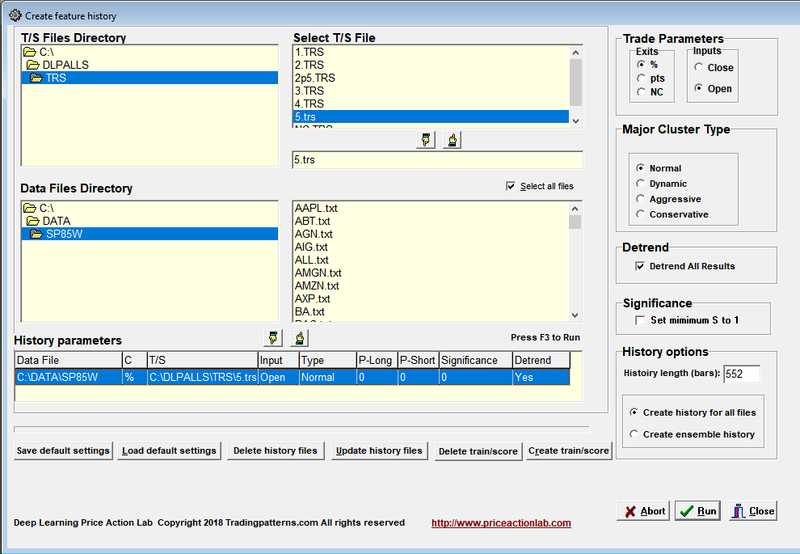 DLPAL LS takes the 85 original historical data files of the stocks as input and creates new files with extension .pih that include the feature values for each instance (row). An example is shown below for AAPL. PLong and PShort are the long and short directional probabilities, respectively, Pdelta is their difference and S is the significance of the results. These are the four features calculated in this mode of operation of DLPAL LS. There are also other features related to ensembles of securities not used in this article. This is an important step that allows data visualization and to make sure everything worked as expected. 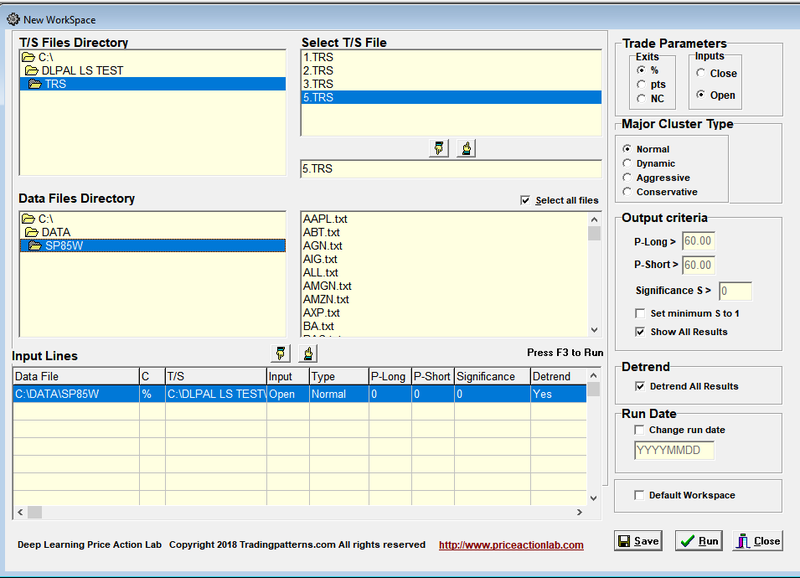 The generated .pih files for each stock are imported in Amibroker in separate database. 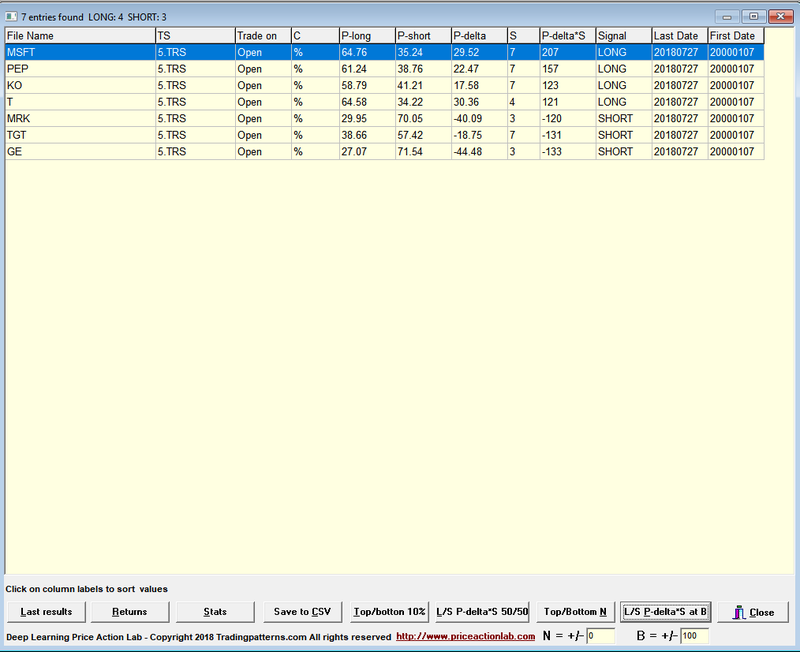 We use Amibroker because of the ease of importing historical data with additional fields. The four indicators are imported as follows: PLong is assigned to Volume, PShort is assigned to Open Interest, Pdelta is assigned to Aux1 and S to Aux2. An example chart of a stock with the indicators is shown below. The chart also included the product Aux1*Aux2, corresponding to Pdelta*S, because this is what is used in the strategy as an entry/exit rule. 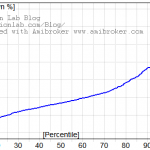 We use a bias of +/- 100 to limit the number of trades and reduce commission cost. The bias results in longer holding periods for positions. MAR (CAGR/Max. DD) for the strategy is 0.74 versus 0.17 for SPY total return in the same period. 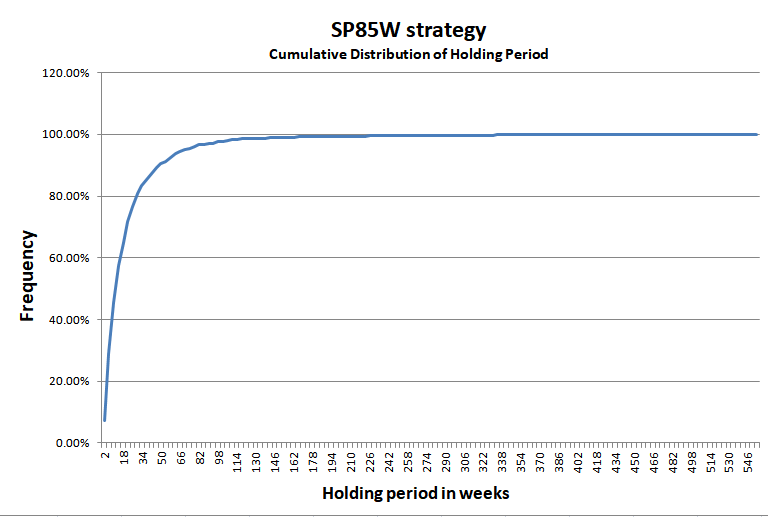 The strategy has low drawdown and can be leveraged to generate returns in excess of SPY total return but at a much lower drawdown. 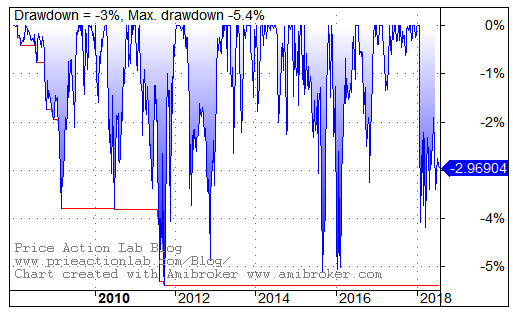 The simulation indicates that there is less 5% probability of a drawdown that exceeds 16%. It may be seen that 80% of the trades have holding period of less than 30 weeks, about 66% of the trades have holding period of less than 18 weeks and 25% of the trades last two weeks, which is the minimum since the exit bar is considered part of the holding period. 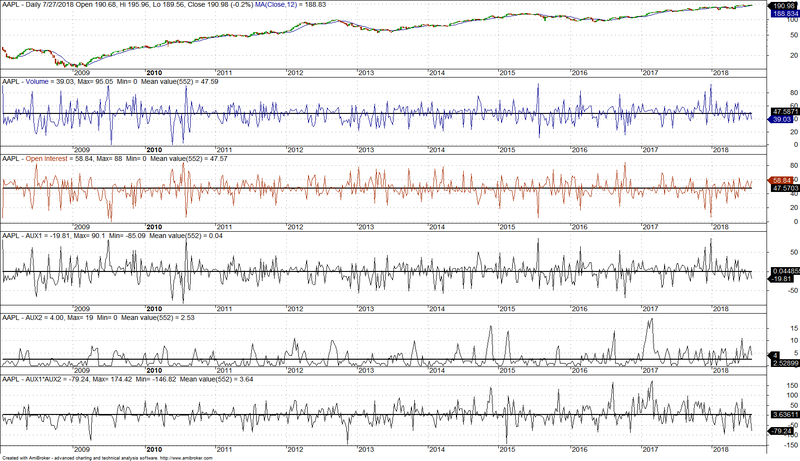 These are the symbols where buy and hold since 2008 was applied by the strategy: MMM, SPG, KO, RTN, MO, GD. For these symbols there has been only an entry to open a long position and no other signals. This is the buy-and-hold part. Alternatively, the features can be updated automatically after updating data files and the model can generate the signals so that filtering and visual inspection is not required. Features can be updated automatically from “Create Feature History” tool. 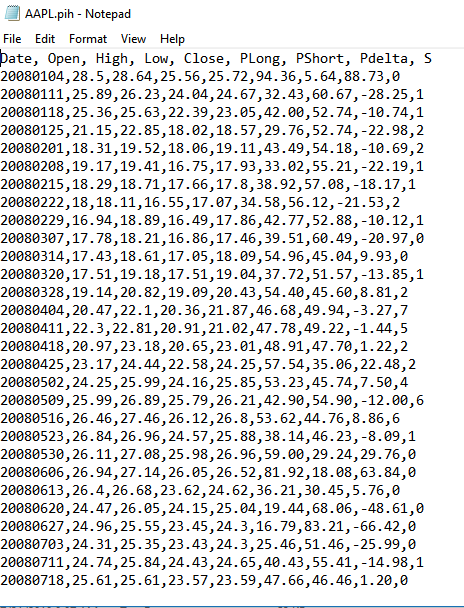 In addition, train and score files can be generated for use with machine leaning classifiers. Some users of DLPAL LS prefer to let classifiers identify an abstract model and make the final selection of stocks to trade. Support Vector Machines (SVM) or even Binary Logistic Regression (BLS) can be used for this purpose. Additional features of choice can be added by the user to the files for more sophisticated models. Click here for more details of how hedge funds can order a free fully-functional demo of DLPAL LS to test for a month.